Welcome to another episode of As the Reels Turn. Click here to play! You'll find your favorite soap characters continuing with their mission to save El Paradiso from their rivals. Tune in to follow your favorite characters and win a lot of cash! There are a few different scatter symbols in this game, including the bonus chip, Danny, Advance to the Next Scene and Ivan. The first two will not only multiply your total bet, but will also trigger bonus features. 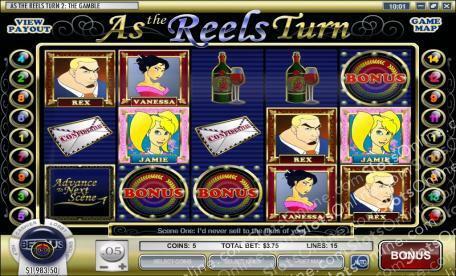 Three or more Ivan symbols will get you a number of free spins in which your prizes are mutiplied by your total bet. And, as always, the Advance icon will allow you to get to the next scene when you spin three or more. There are two bonus icons in this game. If you spin three or more of the bonus chip, you will trigger a bonus feature in which you will choose from a selection of casino chips to reveal how many coins you win. If you pick the fake chip, your game will end. Three or more will mulitply your line bets by up to 50 times. If you spin three or more Danny icons, you will trigger the Danny Bonus Round. During this game you will have to choose from a selection of Dannys. The audience's appreciation of your selection will determine your bonus prize. Two or more of this icon will also multiply your line bet up to 50 times.